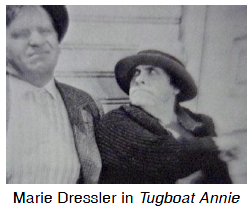 Marie Dressler starred in the Hollywood movie, Tugboat Annie. Soon after the film was released, she died. Originally from Cobourg, Ontario, Dressler went to Hollywood where she enjoyed a successful stage and film career. Other Canadians who became stars in the early days of Hollywood were Walter Pidgeon, Norma Shearer and Mary Pickford. The Bluenose: On the back of the Canadian dime is a picture of the famous Nova Scotian sailing schooner, the Bluenose. Skippered by Capt. 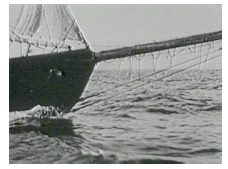 Angus Walters, this graceful ship won several International Fisherman's Trophies from its launch in 1921 until its retirement in the late 1930s. On its first race it beat the second-place ship by over four kilometres. The Bluenose got its name from an old nickname for Nova Scotians, "bluenoses," which originally meant "puritanical: very strict or too strict in morals or religion. Like a Puritan.puritanical." The ship was designed by William Roue for the Smith and Rhuland shipyard. It was not only one of the greatest racing ships of its time, it was an excellent Grand Banks fishing vessel. In its first season it brought home the largest catch ever seen in Lunenburg. Quite possibly the most recognized symbol of Canada, the game of hockey has been a favourite sport in this country for well over a hundred years. 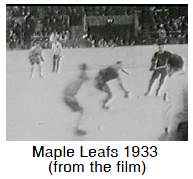 In the 1920s, Canada had three professional leagues which competed for the Stanley Cup. The National Hockey League, the Pacific Coast League and the Western Canada League were all completely Canadian-owned until the end of the decade. By then most of the teams had been bought by American interests. Foster Hewitt was almost as much of a national institution as hockey, itself. His voice was associated with the regular Saturday night broadcasts of the games, first on radio, then on television, giving his exciting play-by-play commentaries and intermission interviews. During the grim days of the depression these hockey broadcasts provided a welcome form of inexpensive entertainment.